Jen Harman has had a few ups and downs today, and unfortunately her most recent hand was one of the latter. 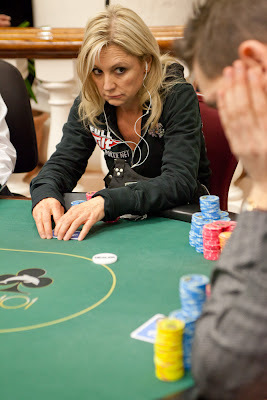 Jen had 3-bet preflop before Joris Springael cold 4-bet. Jen called, and the flop fell ace-ten-ten. Both players checked, and a third ten came on the turn. Joris check-called Jen's bet, and they both saw a jack fall on the river. Joris checked one more time, and after thinking for a bit, Jen checked behind. Jen showed AQ for a full house, tens full of aces, but Joris had rivered the best hand as he held pocket jacks for jacks full of tens. Jen was unlucky to have her opponent hit a 2-outer on the river, but she had a great check to keep her in the tournament right outside of the money bubble.